Wall to wall olive trees in the olive oil capital of the world. We’ve ended up in Jaen today. Not planned, nothing unusual there, but we were on the way to Toledo (planned) when we turned left instead of right and ended up in Jaen. 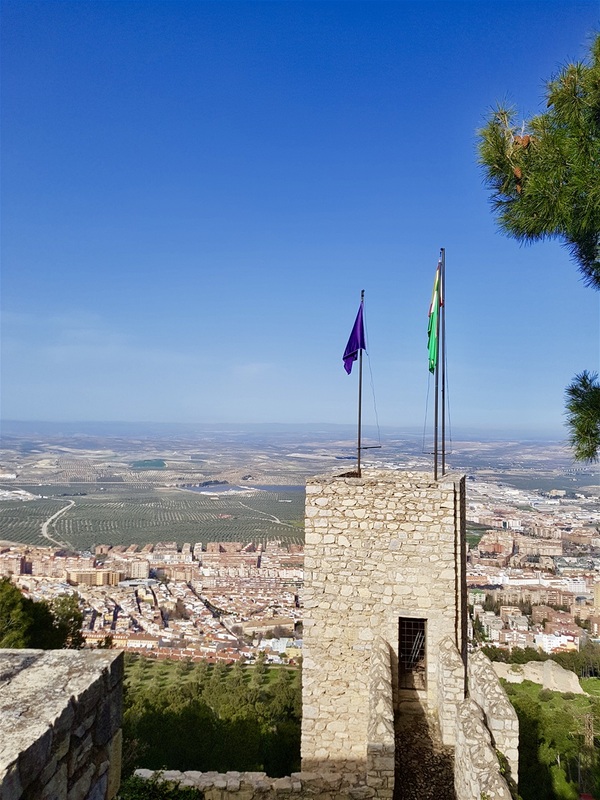 We’ve passed by this place many times, admired the wonderful castle and Parador perched on the hill, but never actually been to Jaen. Until now. Yogi Berra also gave us such spoken gems as ‘It ain't over till it's over’ and ‘It's like déjà vu all over again’ in post game interviews – a wise man, indeed. It’s a (rare) dull, overcast morning as we set off and as we soon find ourselves driving through the heart of Europe’s only desert there’s not much to look at. The ‘western inspired’ theme parks of Texas Hollywood and Fort Bravo look even more desolate today than usual, which is really saying something! There’s a lone ‘cowboy’ on a horse, trying, and failing, to look like Lee Van Cleef and even he appears not to be bothered about looking the part today. We wave as we go by as we’re perhaps the only car he’s seen for quite some time and he makes an effort to doff his Stetson which falls off and blows away. Will be a long day in the saddle today. When we reach the high ground just outside Guadix the clever temperature thingie in the car tells us it’s two degrees outside. We decided against getting out to check if this was an accurate figure. 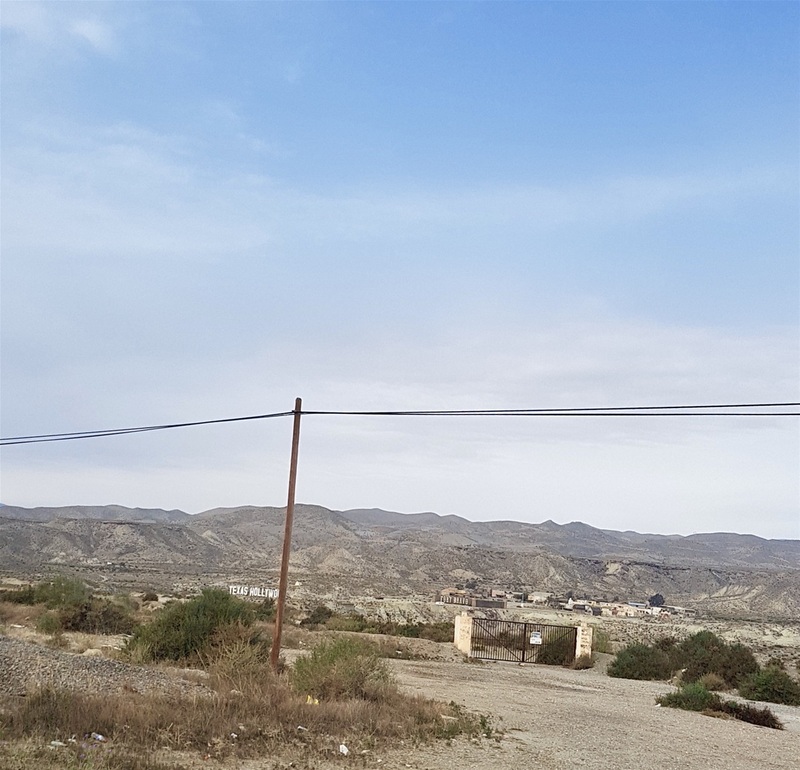 Long before we reach Jaen it gets warmer and the landscape begins to resemble a pointillist painting by Georges Seurat or Paul Signac as on both sides of the road and seemingly stretching to infinity are serried ranks of identical dark green blobs of olive trees. Infantry battalions in battle array, each tree a precise distance from its neighbour; it’s a remarkable sight. Almost half of all the world’s olive oil comes from Spain, most of it from Jaen province and Spain produces vastly more olive oil than the rest of Europe combined. Much of ‘Italian’ olive oil originates in Spain as the canny Italians import olive oil, rebrand it and resell it as Italian produce, at a healthy premium. 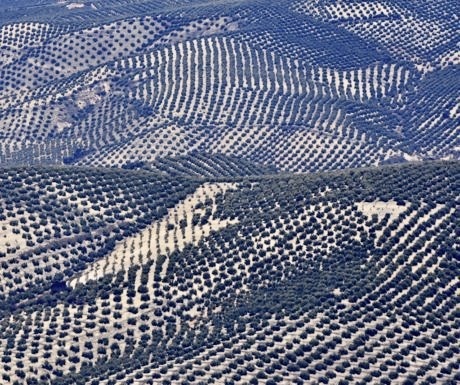 I remember reading there are over 220 million olive trees in Jaen province. Is that all? Looks a lot more than that to me, but I’m not tempted to count them. 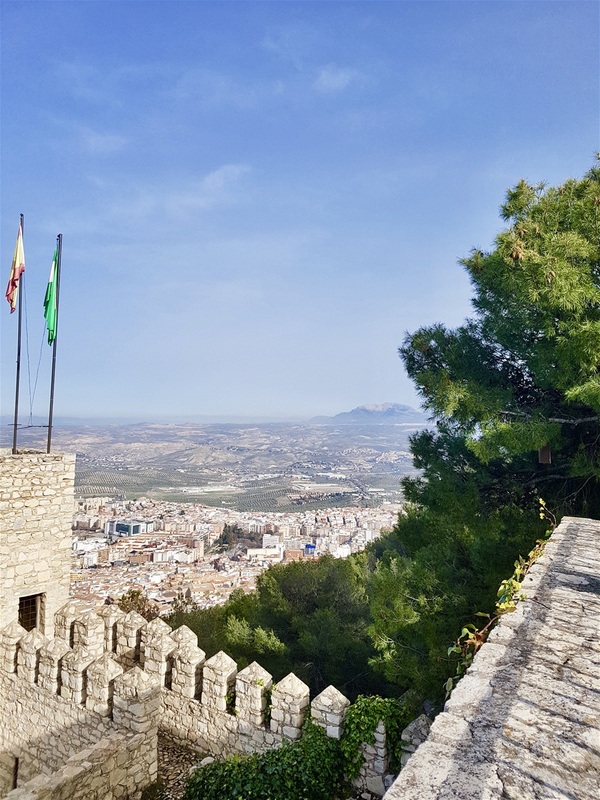 Jaen isn’t a pretty city. Far from it and the traffic is a bit of a pain here as well. 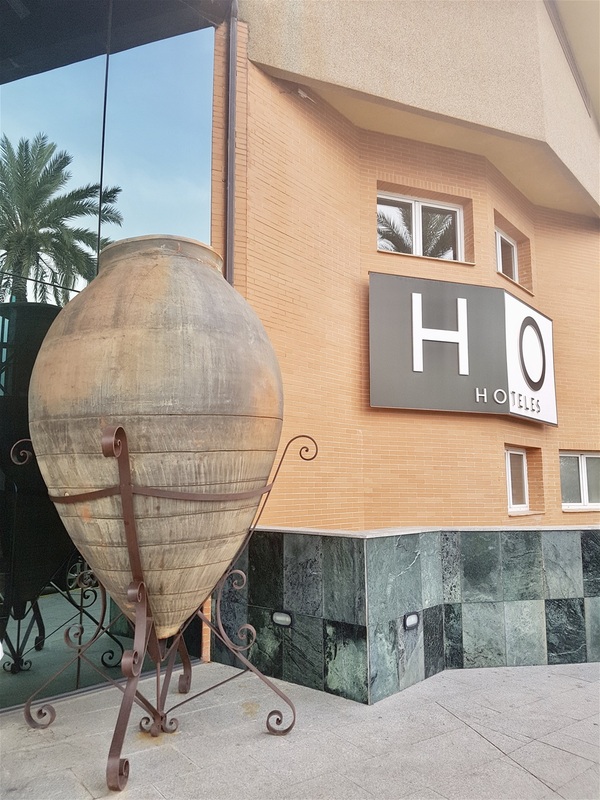 We find a hotel on the outskirts, lovely hotel too after haggling the night’s stay down to Premier Class level, reasoning we can pop into town easily enough from this hotel on the outskirts. Well, not that easily as it turns out. We eventually find an underground car park, hidden away down a narrow alley in the middle of Jaen, but the car we follow down the ramp demolishes the entry ticket machine. A man comes out, waves his arms about and tells us to go ahead and park while he sorts the mess out. We creep past the car in front, which is barely dented even though the ticket machine is a write off, and park in an unreserved free space. As I get out of the car, the irate man from outside rushes back in and shouts ‘not there.’ I move the car up one space, appearing exactly the same as its predecessor, and he nods approvingly. Perhaps J17 is his lucky number and he resents anyone else having it. 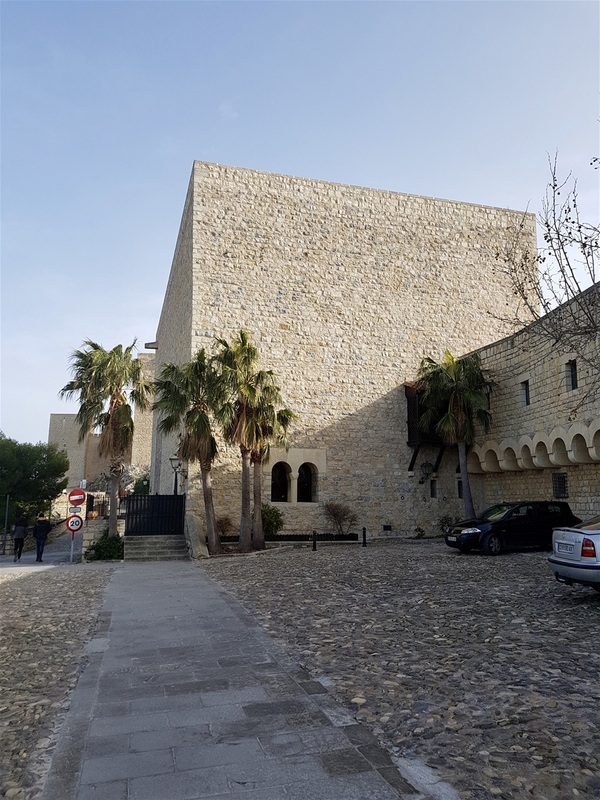 We walk up the hill, over rough uneven pavement interspersed with equally treacherous cobblestones, bound for the cathedral, and are blowing a bit when we get to the top. The cathedral is, of course, closed. I ask a woman eating a sandwich outside the door if she knows why it is closed. She shrugs and says, ‘they open when they feel like it. It was open only five minutes ago when I came here. They told me to go away and closed the doors.’Very strange. I take a photo of the cathedral façade. It’s magnificent, one of the best examples of Renaissance architecture I’ve ever seen. 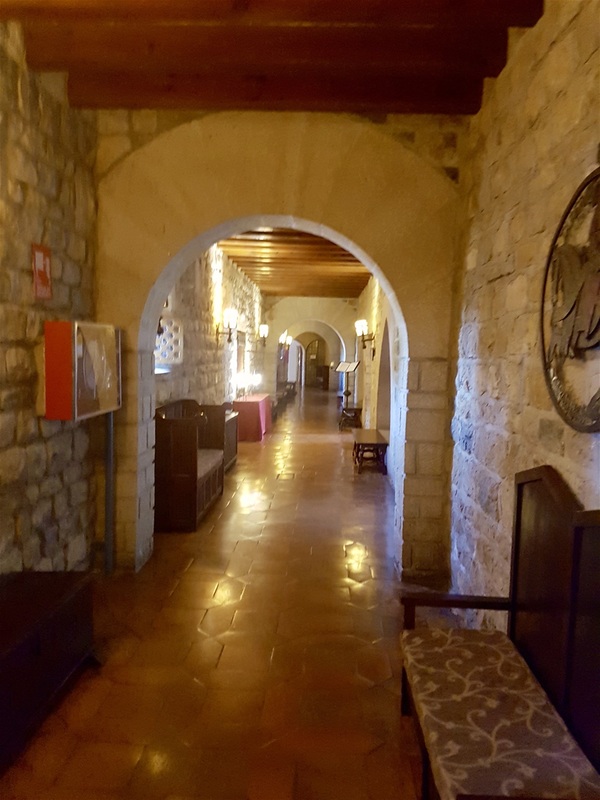 Inside, behind those massive locked doors, is an important relic, the veil of Veronica (Santo Rostro) which appears to bear an image of Jesus’ face after Saint Veronica used her veil to wipe the head of Jesús as he carried the cross to Calvary. As with the Turin Shroud, the authenticity of this relic is in doubt, but it doesn’t seem likely we will get the chance to see it today. We pass a man, seated on the pavement and he calls out, in English, ‘please help me.’ Assuming he is a street beggar we are about to walk on when he calls out again. We turn back and see he is holding a broken walking stick and has a huge bandage on his leg. I help him to his feet and a man runs out from a shop holding an ornate walking stick and says, ‘please take this. Return it when you can.’ The poor man has an injured leg, his walking stick snapped and he couldn’t get up again. Even after these Good Samaritan deeds, the cathedral remained closed. The man who brought over the walking stick said, piously, ‘God hears our prayers, inside or outside a church,’ so that’s us told. We decide to go to lunch and perhaps try again later. We find a café with tables outside and order a drink. 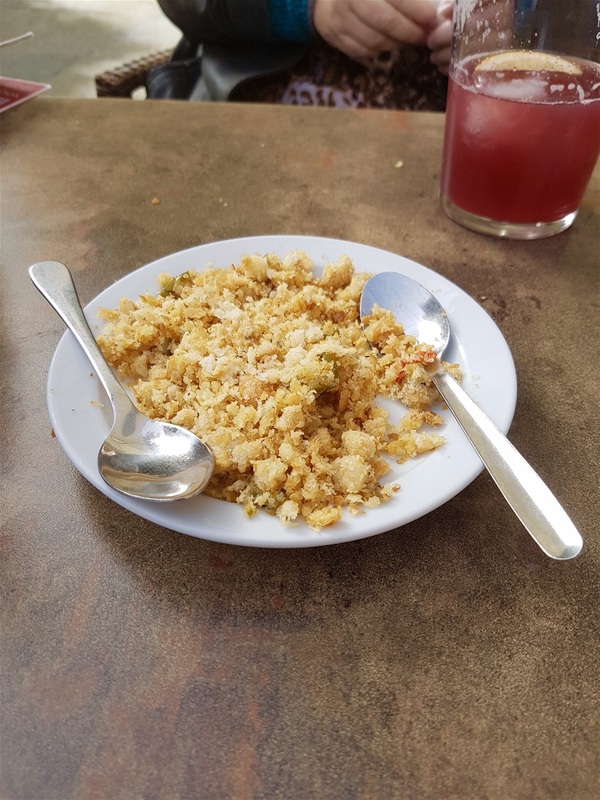 Drinks come with a free tapa here, but what we get is deep fried bread crumbs containing tiny pieces of fish. 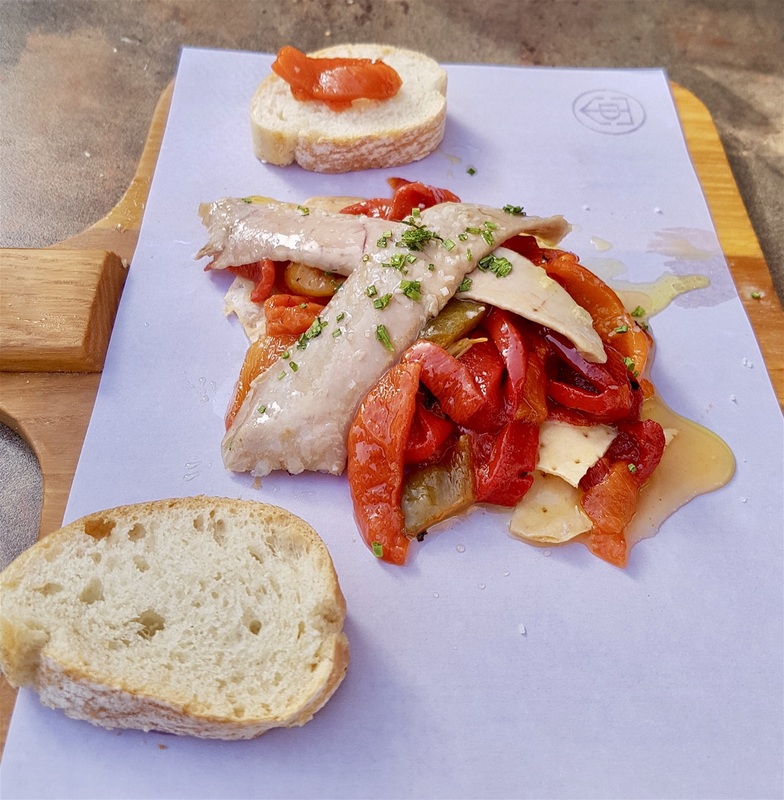 It is really disgusting, but when the waiter sees we have only eaten a tiny bit he brings us another, Barbate tuna and red peppers, which is delicious. 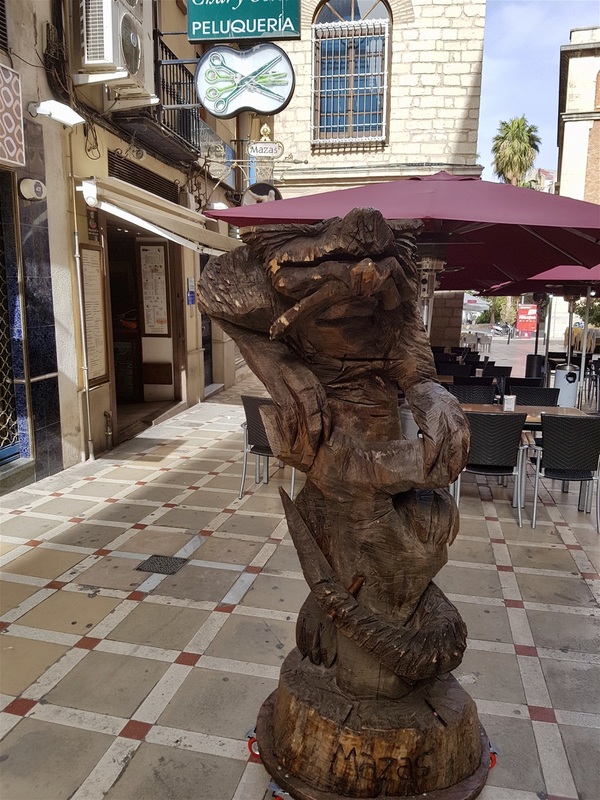 We pop into a dark and dingy tapas bar, just for a look around, and discover a delightfully ‘authentic’ bar, full of weird characters, most of them smoking cigarettes. Those new-fangled laws prohibiting public smoking don’t appear to have reached this area of Jaen. A swarthy man with huge brass earrings makes room on a bench and invites Marigold to sit down, which she does. Nobody offers to move up for me! I order coffee for me, tinto verano for Marigold, and the barman pours me a glass of dark, almost black, liquid from a brown bottle with no label to drink while I wait for the coffee to arrive. I take a sip. It’s the strongest sherry I’ve ever tasted. It’s pretty grim, but after the third sip I start to enjoy the taste. By the time my coffee comes, I have finished the whole glass. Marigold is ‘talking’ to the group on her table by now. Nobody seems to be speaking the same language, but they’re all laughing. This is not unusual as Marigold manages to hold conversations wherever we find ourselves. After lunch, we decide to visit the the Baños Arabes, one of the best examples of Moorish hammams in Spain. 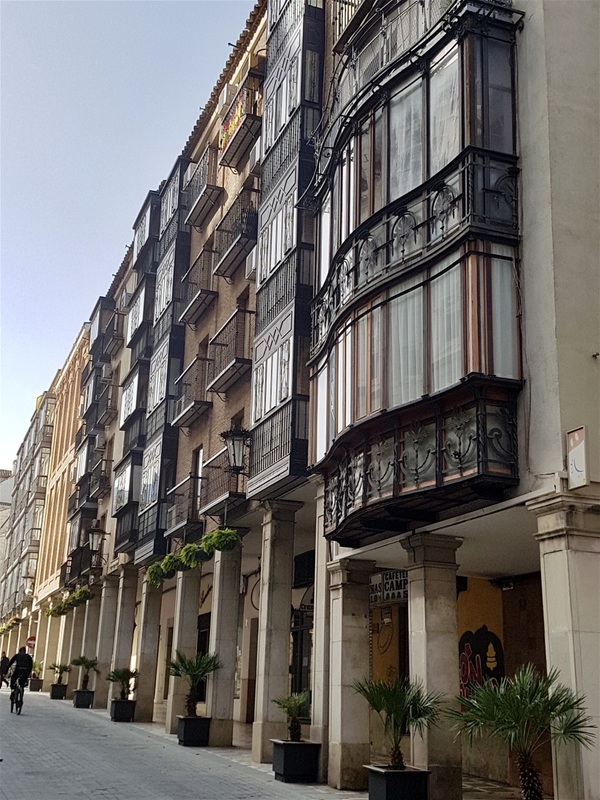 The ones in Jaen are over a thousand years old and the information leaflet says they are probably the largest in Europe. The horseshoe arches and brickwork ceilings with star-shaped windows letting in the light are delightful. Best of all, admission is free! 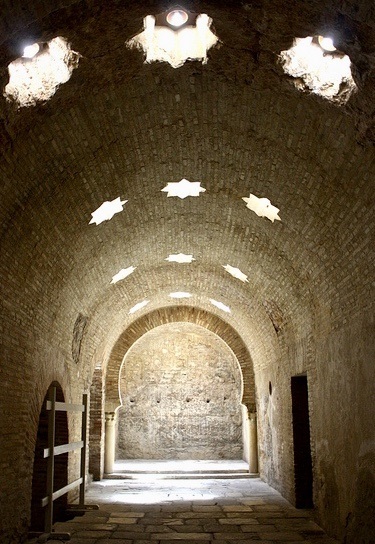 The baths are in the basement of the Palacio de Villardompardo which was built on top of them in the 16th century. 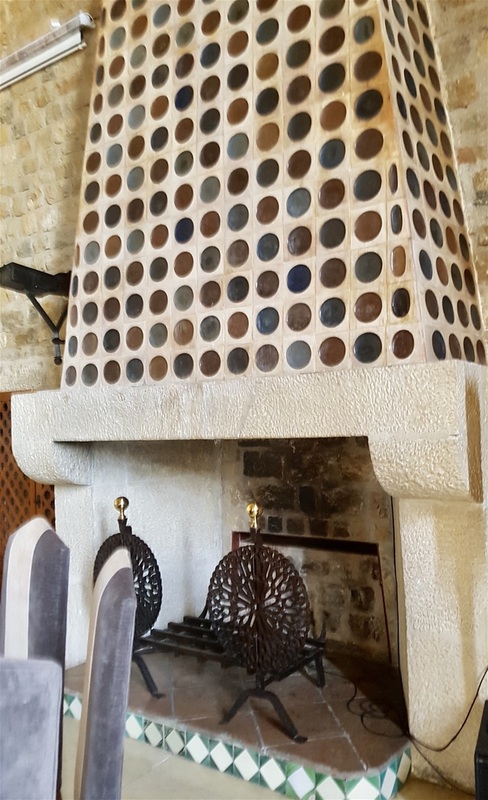 We start our visit in the hallway, a big room with a brick vaulted ceiling with 18 star shaped skylights, move into the warm room and finally into the hot room which is about 50 feet across, alongside the boilers and also covered by stars, allowing sunlight to stream in. The baths were used on a daily basis by Moslems, but also by both Christians and Jews. Women were even allowed in, but of course only at certain times and never when men were around! We didn’t actually bathe. We have been to hammams in Morocco and in Granada, as participating bathers, but decided we were already clean enough today. 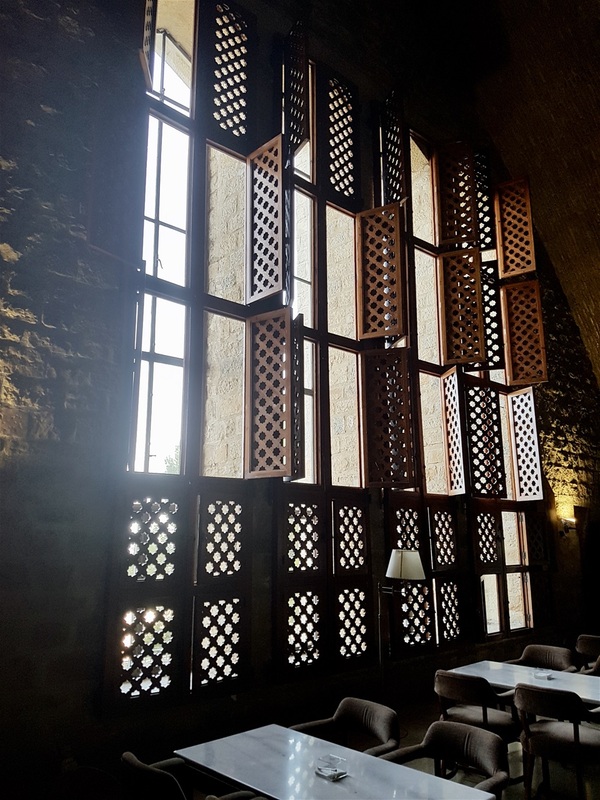 The palace above the hammam was built by Fernando Torres de Portugal, the viceroy of Peru, and Count of Villardompardo, so a pretty well connected chap! It’s as impressive a Renaissance palace as the Count himself and contains A Museum of Popular Arts and Customs and the Naïf International Art Museum, neither of which we could be bothered to walk around as we’d decided to brave the Jaen road system once more and drive up the hill of Santa Catalina to the Parador. 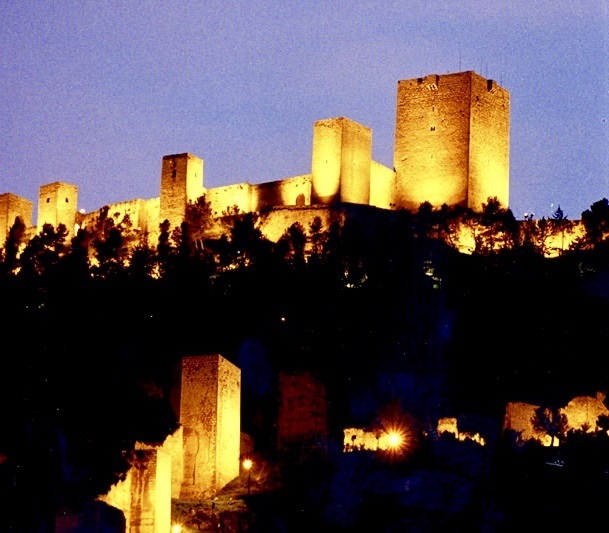 The Parador de Jaén sits alongside a 13th-century Arabic fortress and mimics its architecture to perfection. 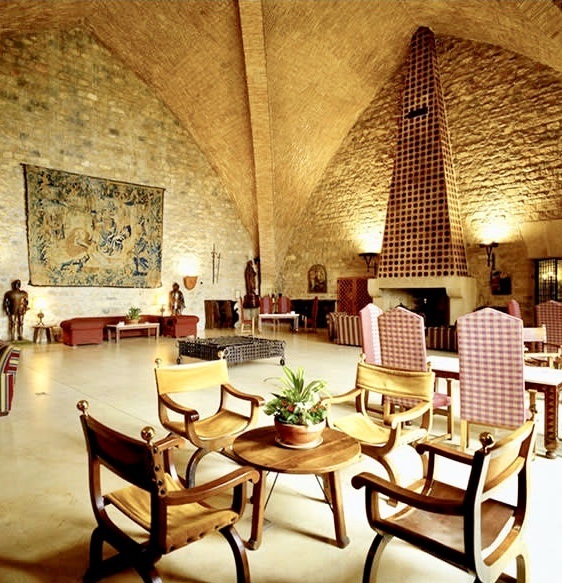 The main public rooms have high ceilings and vast fireplaces, all very impressive. We had coffee in the café, sitting alongside three police officers in uniform. They stopped talking when we sat down, but when they realised we were English, carried on telling what we assumed to be their favourite dirty jokes. They certainly laughed a lot. I nudged Marigold and said, ‘laugh with them next time’ which she did and they all stopped laughing and looked a bit sheepish. Marigold wagged her finger at them and then burst out laughing so they knew she hadn’t actually understood the joke. The policemen have a dozen empty bottles of beer on their table, but perhaps they’re off duty. Hope so. I read in one of those lists that proliferate at the start of any New Year that amongst beer drinking nations, per capita, Britain comes 28th. Czech Republic tops the list. 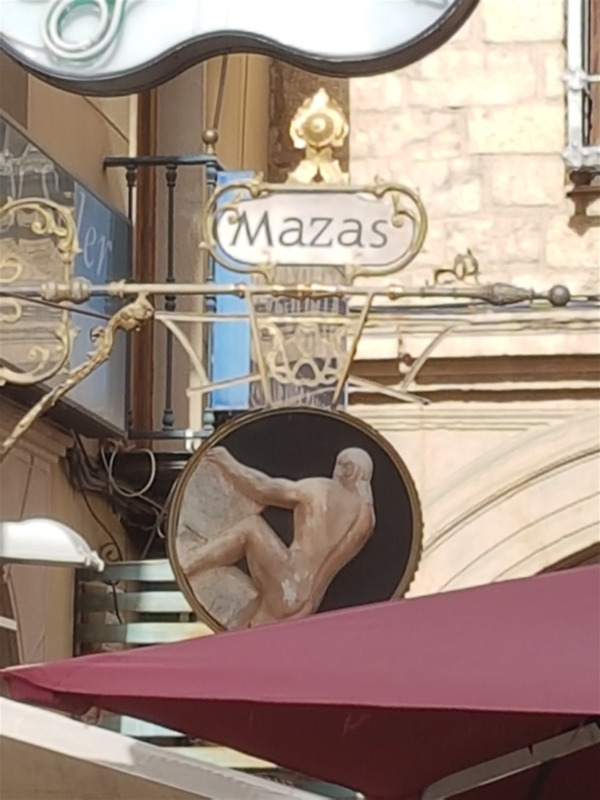 Never particularly noticed this myself on our travels through there, but then again beer is very cheap in the Czech Republic. They’re ‘only’ 9th for alcohol consumption in general though, but Eastern European countries still fill 9 out of the top 10 in that list. The odd one out, ie not in Eastern European, is Andorra in 7th place. Not many of ‘em, but they certainly like their grog. Britain? An unremarkable 25th. 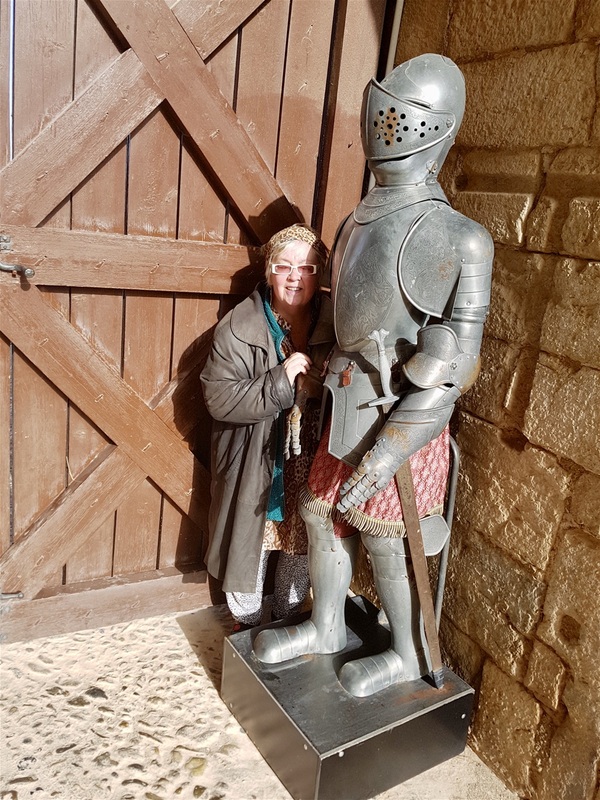 We seem to meet a fair few British ‘good imbibers’ on our travels. Must get thirstier when they leave the U.K.
One of our best friends lives for part of the year in Andorra, part in Spain, so we’re wondering if Spain will now replace Andorra in the top ten as she certainly does her best to keep the figures up. Back in our hotel, we’re sitting in overstuffed armchairs in a room just off Reception reading a book and Kindle respectively when a middle aged couple come barging in, talking at the top of their voices and generally causing havoc. They’re English, of course. The woman has one of those voices whose natural habitat is endless kvetching, whining, complaining* and finding fault with everything. The man says nothing at all. * Yes, tautology, with bells on, but one simply cannot overstate the irritation of this woman’s voice and attitude. Worse is to come as they strut into ‘our’ sitting area, banging luggage about and creating havoc. The whining woman evidently sees Marigold is reading a book with an English title and decides this gives her the right to come over and talk to us. She turns to Marigold and says, ‘he’s got terrible trouble with his rhomboids,’ which, predictably sets Marigold off in a fit of rather unseemly giggles. The woman glares at her. ‘It’s no laughing matter,’ she says, sniffily, and goes away again. I know a bit about rhomboids: there’s a rhomboid major and a rhomboid minor and they are two of the big muscles on the back that link the scapula and the spinal column. I once had ‘rhomboid trouble’ myself and know how painful they are when overstretched, but my attempt to send a sympathetic glance at poor Jim is interpreted by his wife as a demonstration of male solidarity. She sniffs again, loudly, and drags the wretched Jim out of the room. ‘Good riddance,’ says Marigold and we return to our novels in peace. Just as well Jim’s problem was ‘only’ a bad back. I dread to think how I would have coped with a hysterical Marigold if flatulence had been his problem. Is this what the Old West looked like? Pretty grim then. For those who like to see what the bathroom ‘stuff’ looks like. 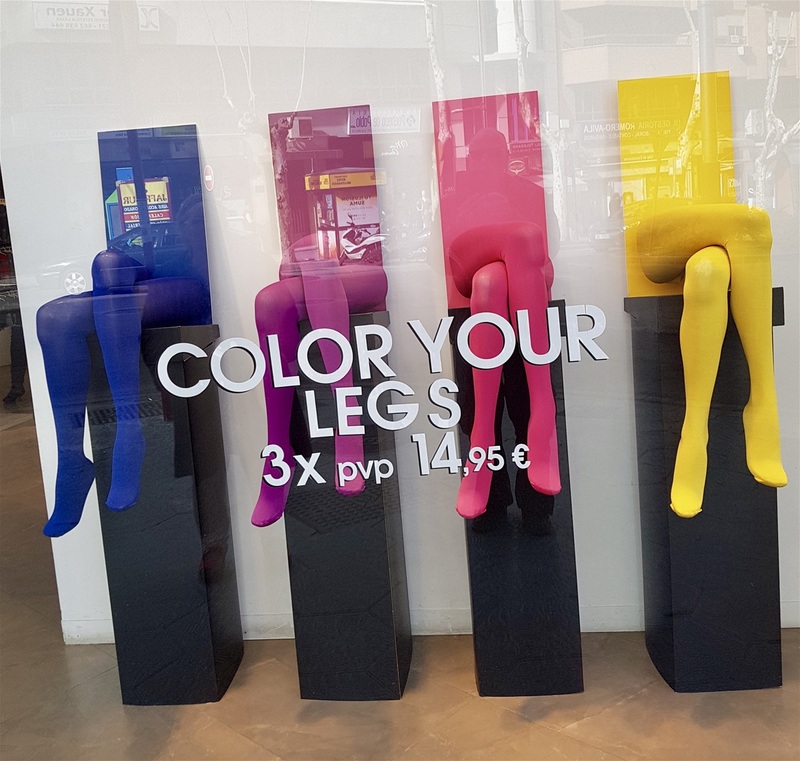 Why were people taking pics of this window display? No idea, but didn’t want to be left out. Lot of work went into that. What is it? No idea. A lizard? 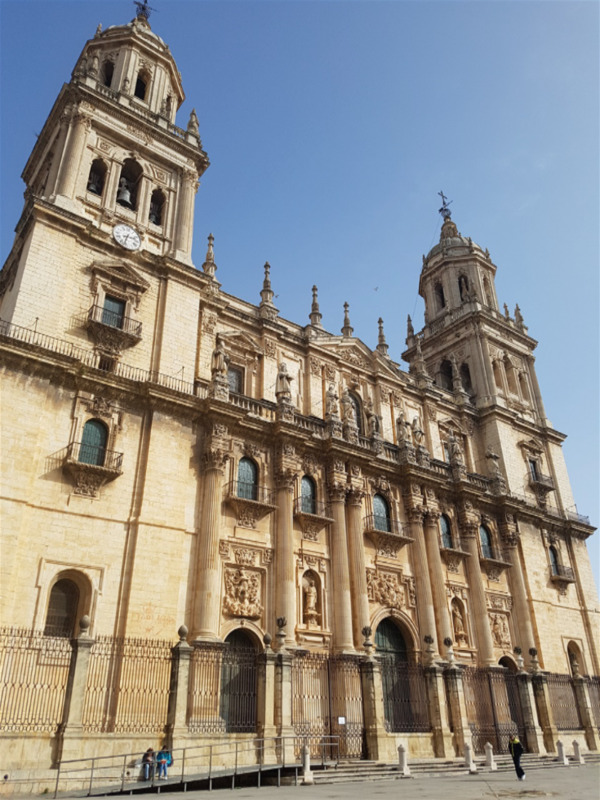 Jaen cathedral. Closed for unknown reasons. 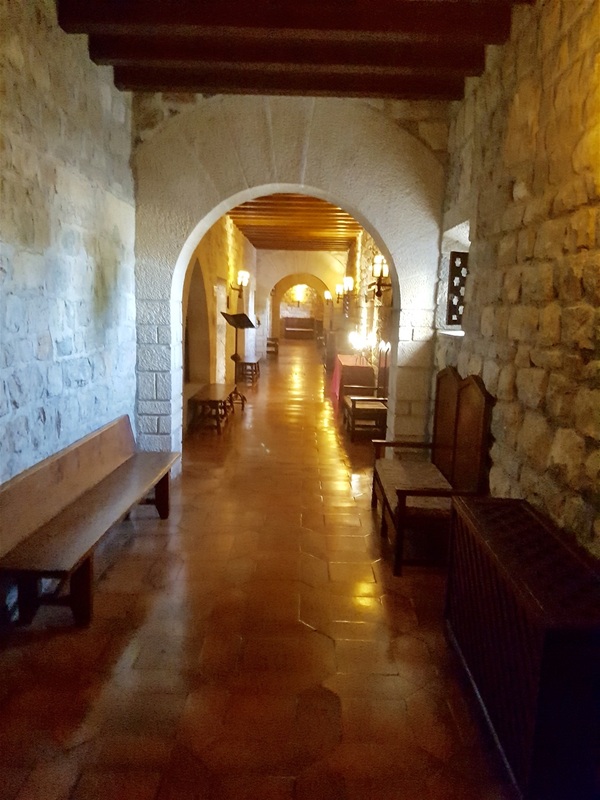 Same corridor, looking the other way. It’s a big place! 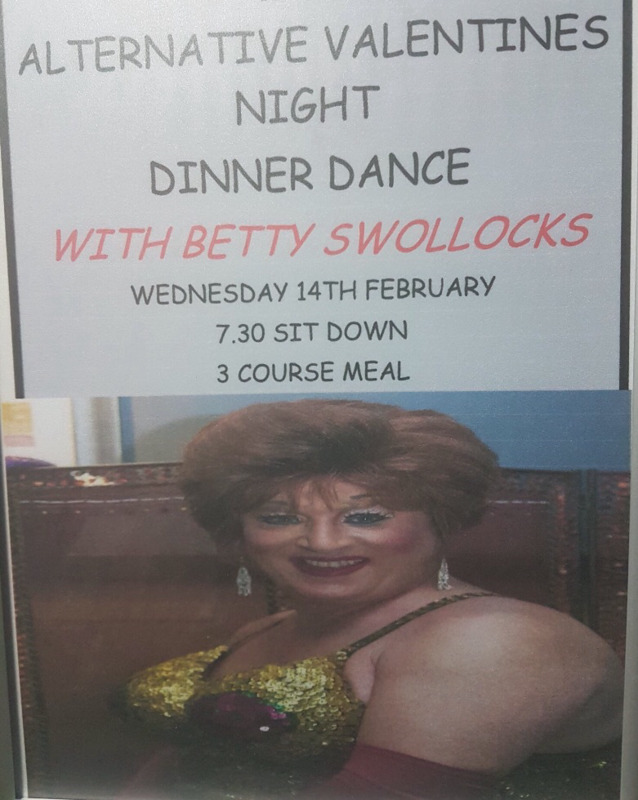 Well, that’s Valentines Day sorted. Okay, maybe not.